There is a vast difference from a painter who will apply paint straight from the tube and one that diligently mixes colours in order to achieve a particular effect within a painting.Arguably there is nothing wrong with buying ready mixed colours and using them as they are, except that it limits one to representing a scene according to what is available in the tube. Although there are a vast array of colours available to buy ready mixed, you will always be open to more choice if you mix your own colours. Water colour painters tend to mix colours on the paper and do not traditionally use white, relying on the white of the paper instead. A palette needn’t be a piece of wood shaped as a traditional artist’s palette, and in fact a smooth rectangular white surface should suffice. A piece of clear and clean glass placed upon a white sheet of paper, or a piece of white Perspex is perfect as the smooth surface ensures ease of movement, whilst the whiteness ensures that colours can be accurately judged. The bigger the palette the better, as it will allow for a full range of colours. A thumb hole may be cut into the palette if felt necessary, although this will be beneficial chiefly if you are painting outside. Otherwise you may prefer to place your palette on a table close to your easel or canvas at a height convenient to you. Whilst there are ‘systems’, there is no one way to arrange a palette. It is usual to have a pool of black paint and one of white at opposite corners of a palette, with a line of cold colours (such as green and blue) descending down one side of the palette from the black, and a line of warmer colours descending down the other side from the white (such as red, yellow and orange). Alternatively pools of white and black may be placed on the palette, with just the primary colours (red, yellow and blue) placed also on the palette along one side, with all colours being mixed from these three main colours. 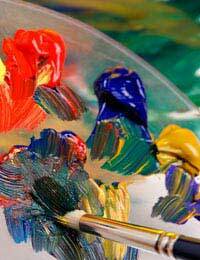 Some artists place several different dabs of each colour on a palette to avoid contamination of that colour. Contamination can also be avoided by having a different brush for each colour and by mixing all colours with a palette knife that is cleaned a new for each colour. The Palette knife is used to ‘fold’ two different colours into one another a little like when you turn different ingredients over and over on top of one another when mixing them together to make a cake. The palette knife is commonly used for mixing oil, acrylic and gouache, and can also be used to apply paint to the canvas. It is vitally important to keep the palette free from the build up of paint, as the flat smooth surface enables smooth handling. The main thing is to devise a way of working that you are happy with and to stick with it. Having some sort of system in place when using a palette means that you can be assured that decisions you make arise from choice, not as a result of the random contamination of colours. These colours that are produced from the mixing of primary colours are called secondary colours. Other colour variations can be made by adding a primary colour to a secondary colour. For example adding Red to Orange will make a Red-Orange: Adding Yellow to Orange will make a Yellow-Orange. The resulting variations on Orange are called ‘tertiary colours’. One good exercise is to mix up all of the secondary and tertiary colours and paint a dab of each on a sheet of paper with its name beneath. You can then refer to this sheet whenever you wish to produce a particular colour.